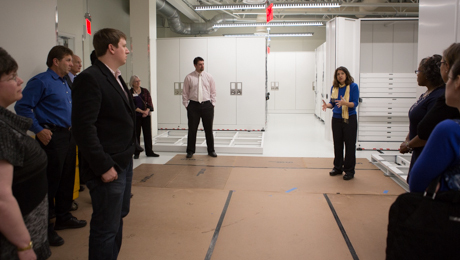 Members of the GW community get a tour of the conservation and collections resource facility. The conservation and collections resource center has been designed using state-of-the-art technology to support the Albert H. Small Washingtoniana, The Textile Museum and GW fine arts collections. Museum staff members are preparing to move items into the new space in coming weeks. “It’s an enormous enterprise, and this is really one of the best-equipped museum storage facilities in the country,” said John Wetenhall, director of the George Washington University Museum and The Textile Museum. Registrar Rachel Shabica explains how textiles will be stored in the new facility. Following Friday’s event for the GW community, an open house was held Saturday so members of The Textile Museum could also preview the center’s exciting capabilities. The private facility will now be closed to the public, serving as behind-the-scenes support for the George Washington University Museum and The Textile Museum under construction on the Foggy Bottom Campus. The conservation and collections resource center will only be open to scholars and academics through research appointments. 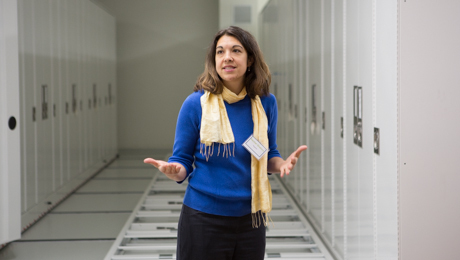 The LEED silver-certified facility contains temperature and humidity controls and an air filtration system for the long-term protection and care of the collections. It also has a conservation lab and a dye lab to restore objects before exhibitions. Lizz Campos, a second-year museum studies graduate student, has been preparing for the opening of the center since working as an intern at The Textile Museum last semester. On Friday, she spent the day as a volunteer, greeting visitors eager to participate in tours and walkthroughs of the building’s labs, preparation areas and storage spaces. Many of the visitors who embarked on tours of the expansive building were surprised to learn the many considerations that go into storing ancient objects, particularly for textiles that date back to 3000 B.C.E. Anoush Dadgar, a staff member in the IT department, was astonished when he got a step-by-step explanation of how each textile is frozen at sub-zero temperatures to ensure no pests sneak their way onto items and launch infestations. Members of the GW community got to preview the different spaces of the center. Mr. Dadgar said that he didn’t realize how much work goes into museum conservation, but he wanted to learn so he could better understand the efforts GW is undertaking on the Virginia Campus. “I came because this is a big part of the community—I work here on campus, and I wanted to see the building because it’s something that the university has put a lot of work into,” Mr. Dadgar said. Bruce Baganz, president of The Textile Museum’s Board of Trustees, said the facility represents the collaboration of GW and museum staff members. Dr. Wetenhall called the event a tremendous milestone, and explained that the facility offers myriad academic opportunities, since it will be the primary building scholars will use to study collections. 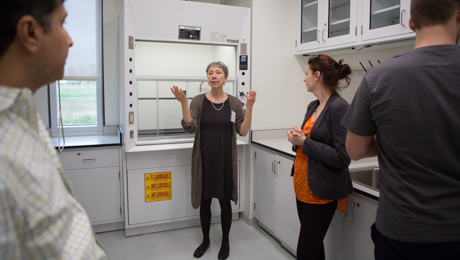 Guests also toured conservation labs with Esther Méthé, The Textile Musuem's chief conservator.